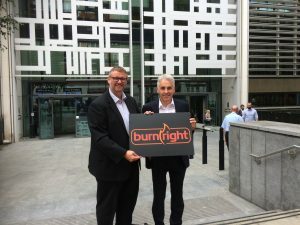 Burnright is writing to major national media outlets in the UK in a bid to tackle the scourge of fake news surrounding woodburners and multi fuel stoves. The campaign feels it is time for the industry to fight back, so it is writing to national newspapers and broadcasters to outline the facts. This includes the rarely-reported fact that despite claims by some, 2017 actually recorded the lowest level of pm 2.5 for the last 50 years! It will also be providing a localised version which sweeps, installers/stove shops and fuel merchants can use and send to their own local media organisations. Lawson Wight and David Sudworth, co-founders of Burnright, said: “It’s time for the industry to fight back. “There’s no doubt the negative headlines have had an effect among consumers. Customers regularly ask us about the issue, and also we know from speaking to other industry professionals, that some customers have actually made conscious decisions not to buy an appliance because of the media attention. “The fact is that solid fuel remains very popular and will still be able to be used by people right across the UK. We’re working closely with Government to ensure that consumers have accurate information and that this information gets to as many people as possible. The Burnright campaign and other industry initiatives are doing just that and are already making a big difference. “Of course, nobody can ‘control’ what the media says, and nor would we want to. A free press is the cornerstone of our democracy. However, it’s important that they are aware of the facts so that they don’t unknowingly produce reports which are misleading or inaccurate. It’s time for some balance and Burnright will provide it. “We will also soon be creating a template letter for solid fuel professionals to send to their own local TV, radio and newspapers. Local media is still well read by many, so it’s important that the message is spread as far and wide as possible. “Once the template is ready, we will publish it on the Burnright website so it can be used and adapted by local professionals as they see fit. Burnright representatives have a stand at this weekend’s National Association of Chimney Sweeps (NACS) exhibition in Stratford-Upon-Avon.